If Japan had burly roughnecks and lumberjacks, Nikujaga (肉じゃが) would be their meal. It’s a real work horse of the Japanese home kitchen and quite literally translates to “meat and potatoes”. Being high in energy, low on prep time and very tasty, it’s no surprise why. Nikujaga is one of those dishes that anyone could wing without a recipe once you know the gist of what it’s supposed to taste like. The beef can be anything from ground chuck to short ribs; just make sure you use a cut with enough fat, otherwise the meat will get dried out. As the name implies, you need to add potatoes, but I also like to add carrots and onions for color and flavor. Beyond that you can add pretty much whatever you want. 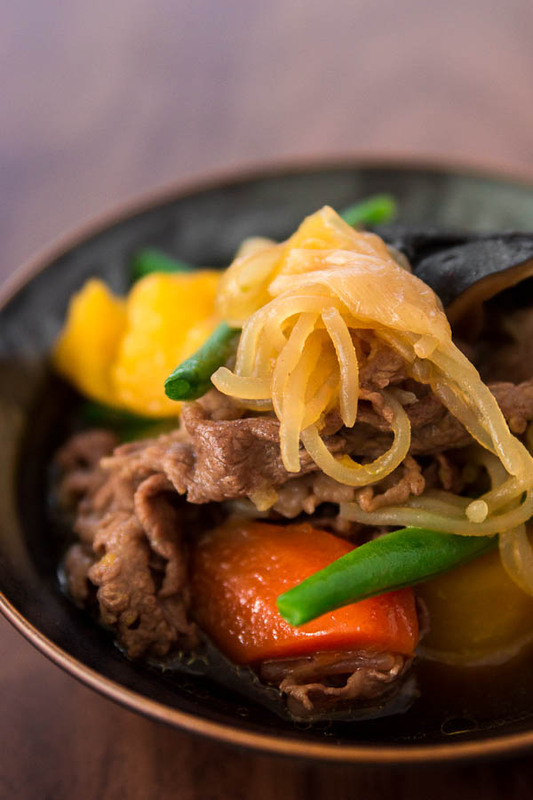 Cook Nikujaga in dashi because it adds umami, but low-sodium beef stock, or even water would work fine. As for the seasonings it’s traditionally seasoned with soy sauce, sugar and mirin which gives it a savory sweet taste, but you could have some fun here and season it with ginger, garlic, tomatoes, and herbs. Because there are plenty of potatoes in it, Nikujaga can be served by itself with a frosty beer, but it’s also great with rice. Like any stew, this is one of those dishes that tastes even better the next day, so make a big batch and enjoy the leftovers for a few days! Heat a heavy bottomed pot over medium-high heat until hot. Add the oil, then stir-fry the beef until cooked through. Transfer to a bowl, with tongs or a slotted spoon, leaving as much of the oil in the pot as possible. Add the onions and fry until translucent. Add the potatoes, carrots, and shiitake mushrooms and continue stir-frying for about 3 minutes. Add the sake and bring to a boil until you stop smelling alcohol (1-2 minutes). Add the dashi, sugar, salt, soy sauce, and shirataki, and then return the beef to the pot. Simmer, partially covered for 30-40 minutes, or until the meat is tender and the carrots and potatoes are very soft. Add the green beans and cook uncovered until they are cooked through. Serve immediately, or refrigerate overnight to allow the flavors to develop. 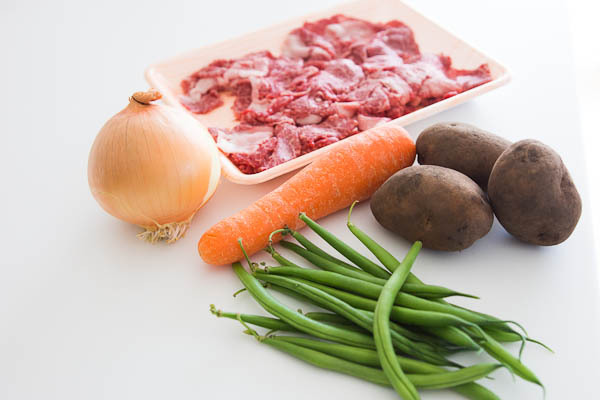 This entry was posted in Food and tagged beef, dashi, food, japanese, meat, potatoes, shiitake by Miss P. Bookmark the permalink.